The MSE100 ergonomic gauge is a simple-to-use, ergonomically designed mechanical instrument ideal for muscle strength evaluations and job task analysis. The Chatillon MSE100 Series mechanical dynamometer is ideal for ergonomic evaluations, job task analysis, functional capacity, and muscle strength analysis. The dynamometer features a large, 2.25-inch dial for easy readability. The concentric dial measures clockwise only. A peak hold button captures peak readings and can quickly be returned to zero. The dynamometer has an accuracy of +0.5% of full scale, and a mechanical overload feature to protect the dynamometer from damage. The durable, plastic housing fits naturally in the hand for a comfortable and firm grip even at maximum loads. The dynamometer may be mounted to a test stand for even greater control and consistent results in repetitive testing applications. Dial rotates 360 degrees for taring. The MSE100 is an excellent, portable solution for physical tensile (Pull) or compression (Push) testing. 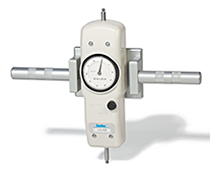 Find the Declaration of Conformity for the MSE100 Series ergonomic force gauge here.